The Use Case deals with cold rolling mill for the production of steel strapping. 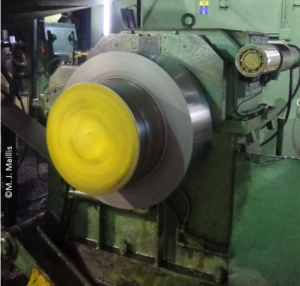 Cold rolling is a process of reduction of the cross-sectional area or shaping a metal piece through the deformation caused by a pair of rotating in opposite directions metal rolls. Cold rolling occurs with the metal below its recrystallization temperature. Within UPTIME following questions are addressed: are all of the maintenance activities performed at a certain period of time necessary or can maintenance intervals be expanded in order to eliminate the economic impact? It is of outmost importance for M. J. Maillis to have their machine or a piece of equipment that can tell its current health status and the degree to which that status deviates from normal or healthy along with predictions about its future health state as well as actions recommendations. The ability for machines to perform self-assessment, on the basis of which decision making can be significantly enabled, will allow improvement on their products’ entire life cycle.